The 2015 IEEE International Conference on Communications (ICC) was held in London, UK from 8-12 June. Themed “Smart City & Smart World,” this flagship conference of the IEEE Communications Society attracted a record-breaking 2,947 attendees. The technical program of IEEE ICC 2015 consisted of 12 symposia, 27 workshops, 20 tutorials, as well as 18 industry panels. 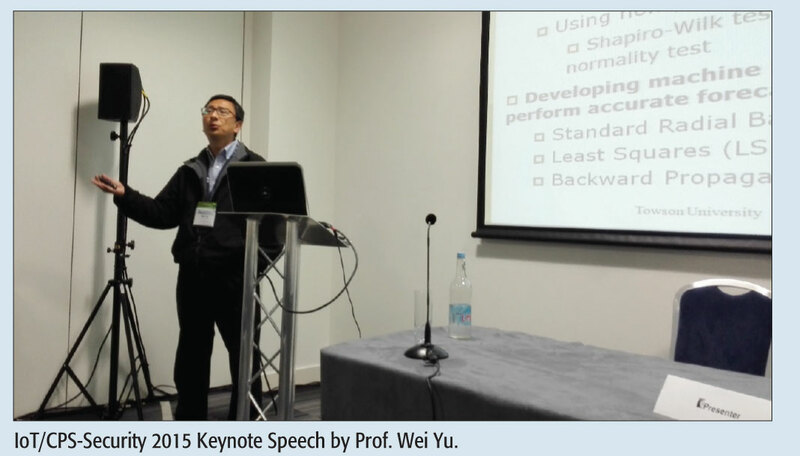 ICC 2015 also featured seven keynote speeches. The First IEEE International Workshop on Security and Privacy for Internet of Things and Cyber-Physical Systems (IOT/CPS-Security 2015) was one of 24 full-day workshops in conjunction with ICC 2015. Recent advances in networking, communications, computation, software, and hardware technologies have revolutionized the way humans, smart things, and engineered systems interact and exchange information. The Internet of Things (IoT) and Cyber-Physical Systems (CPS), which are the major contributors to this area, will fuel the realization of this new, globally interconnected cyber-world. Yet the success, prosperity, and advancement of IoT and CPS systems strongly depend on the security, privacy, and trust of the IoT and cyber-physical devices as well as the sensitive data being exchanged. While these technologies offer many new possibilities, the increasing complexity of hardware and software as well as the worldwide access increase the vulnerability to security attacks. Successful attacks targeted to IoT devices and CPS systems have in common that not only a single computer is affected, but also interconnected technical systems allowing interaction with the physical world are influenced leading to malfunction of devices and control systems with severe financial, environmental, and health losses. This fact highlights the need to develop novel tools that will constitute the heart of a much-needed science of security for IoT and CPS and will assist in building resilient, secure, and dependable networked systems. The aim of the IEEE IOT/CPS-Security workshop series, with the first edition in 2015, is to foster a research community committed to advancing research and education at the confluence of cybersecurity, privacy, Internet of Things, and cyber-physical systems, and to transitioning its findings into engineering practice. IOT/CPS-Security 2015 was a joint effort among active researchers on three continents: Europe, Asia, and North America. Anastasios A. Economides serves as a professor at the University of Macedonia, Thessaloniki, Greece, and the director of the Computer Networks & Telematics Applications (CONTA) Lab. Minho Jo serves as a professor at Korea University, Sejong Metropolitan City, South Korea, and the Editor-in-Chief of KSII Transactions on Internet and Information Systems. Houbing Song serves as an assistant professor in the Department of Electrical and Computer Engineering at West Virginia University, Montgomery, WV, USA, and the director of both the West Virginia Center of Excellence for Cyber-Physical Systems (WVCECPS), sponsored by the West Virginia Higher Education Policy Commission, and the Security and Optimization for Networked Globe Laboratory (SONG Lab). Houbing Song is the lead editor of two books, Cyber-Physical Systems: Foundations, Principles and Applications and Security and Privacy in Cyber-Physical Systems: Foundations and Applications, both of which will be published in 2016 by Elsevier and Wiley, respectively. The General Chairs of IoT/CPS-Security 2015 were Anastasios A. Economides, University of Macedonia; Houbing Song, West Virginia University; Minho Jo, Korea University; and Daqiang Zhang, Tongji University. The Technical Program Chairs of IoT/CPS-Security 2015 were Krishna Kumar Venkatasubramanian, Worcester Polytechnic Institute; Eirini Karapistoli, University of Western Macedonia; Vasilis Friderikos, King’s College London; João Paulo Miranda, Center for Research and Development (CPqD); Dev Audsin, Orange; and Jianguo Ding, University of Skövde. IoT/CPS-Security 2015 received 49 papers and accepted 12 papers. Papers were submitted from 24 different countries and regions across five continents: North America, Europe, Asia, Africa and Australia. IoT/CPS-Security 2015 also featured two keynote speeches by Dr. Jesús Alonso-Zárate, who is a senior research associate and the head of the Machine-to-Machine Communications (M2M) Department at the Centre Tecnològic de Telecomunicacions de Catalunya (CTTC), Barcelona, Spain, and Prof. Wei Yu, who is an associate professor in the Department of Computer & Information Sciences at Towson University, Towson, MD, USA. Their talks were entitled “Enabling Autonomous Communications between Machines, Humans, and Things” and “Secure Energy-Based Cyber-Physical Systems,” respectively.